Lauri Lane Mountain House - Your Home Away From Home To Visit Yosemite! 3 Bedroom, 2 Bath Home With Mountain Views Close To The South Gate Of Yosemite! Only 18 miles from Yosemite southern Gate entrance. It is then a beautiful drive to the valley floor with spectacular views all along the way! Lovely vacation home accommodates as many as 7 guests. Located on a quiet hilltop offering panoramic views of the Sierra Mountains. All the comforts of home away from home. New Heating - A/C for your seasonal comfort. Two very comfortable New King Size beds, queen pull out bed and a extra large roll a way bed. All really comfortable with memory foam toppers! Intimate seating area around brick fireplace for those chilly fall and winter nights. Extra large bath towels. Laundry room stocked with detergent, iron & ironing board. Four flat screen TV's in living area and all 3 bedrooms with Satellite channels! WIFI. Fully equipped Kitchen. This is a Solar home with a electric hot water heater! Only 2 miles from Golf Course! Only 4 miles to Restaurants, Charming Shops, Cinema and Grocery Sotres. WHAT YOU NEED TO BRING? Your food, drinks and charcoal if you would like to use BBQ. We bought this home to make a long time dream come true. Owning a vacation home in the mountains that we love! I live in Visalia, CA an hour and a half from the Lauri Lane Mountain House. We have been in business for almost 2 wonderful years. We have the home listed on Trip Advisor and we have been blessed to have renters from all over the world stay in our home. We have great reviews from our guests and we have the highest rating with them. We have taken a lot of joy in furnishing and decorating the home with a bear motif. We are always improving the property to make each guests vacation the most relaxing and comfortable possible! I look forward to working with you for your vacation! My Grandparents have lived in Oakhurst, CA since I was a child. My mom now lives in Oakhurst and it has always been my second home. I love the trees and the fresh air.The home is on a acre of land so you are not right on top of any neighbors. The home is really peaceful and quite. Yosemite is just up the road on Hwy41 and it is a easy drive from the Lauri Lane Mountain House. All our guests love how easy it is to get to Yosemite for our home. There is a lot to do in the town of Oakhurst. Everything is very close to the home, shopping, movies, fast food, restaurant's, train rides and outdoor activities! We fell in love with this home because of it's rustic charm, the view of Deadwood Mountain from the living room, as well as it's private location. We searched for almost 2 years to find the right place at the right price. We then spent a whole year to get it ready to rent. Painting, remodeling, a new heating and air conditioner, solar, flooring and new appliances in the kitchen and laundry room. The beds are so comfortable...a lot of my guests have asked what kind of beds they are because they want to buy there for their own homes. Working on this home has been one of the most rewarding things we have done, to be able to share my home with my guest from all over the world! Many of which have returned more than once and they always recommend us to their friends and family. Conveniently located for all bedrooms and living areas. Extra large bath towels...just bring your tooth brush! Beautiful views of the Sierra Nevada mountains! There are some basic spices in the kitchen for your use. Thoroughly enjoyed our stay. Very neatly maintained. Suits well for family trips to Yosemite. We would go back if ever in the area. I became ill on our travel there, both the home and the manager was very accommodating. I spent several hours in a recliner looking out over the view shown on this property. I highly recommend the Lauri Lane Mountain House, it was full stocked with items one needs when they first arrive. We are very impressed with Gina, she was great. Thank you so much for the wonderful review! I loved getting to meet you and your family. I was so sorry that you were ill, but I hope the relaxing view and the peace and quite helped you get a little better! Please come back and stay with us anytime! I am so happy that you and your family had a great vacation! Please come back and stay with us anytime! This home is a great spot to stay if you want to be near Bass Lake but also away from the crowds. Lovely yard, great sized home with plenty of space for everyone. Home is an older style but everything works well and the bear l-themed decor is really cute! The beds are really comfy but you may want to bring your own pillows. Thanks so much for the wonderful review. We love the Lauri Lane Mountain House with all it's charm and plenty of space for our guests. I buy new pillows every couple of months and new ones are on their way. Please come back and stay with us any time. Overall, we enjoyed our stay and the hospitality. Thanks so much for the review. I am so glad that you had a great vacation! The kitchen has an electric stove top and appliance's because we have a solar home. All the appliance's are only 3 years old and all work great. 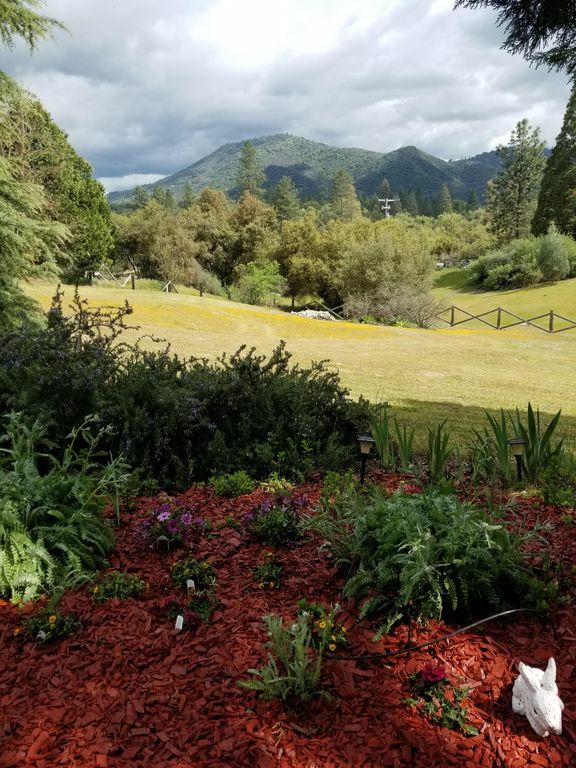 We choose not to update to much or we would have to charge more for the home and we like keeping it low so more guests can enjoy our area and Yosemite. Please come back and stay with us anytime. Clean, well maintained, with comfy beds, and room for my husband and I us our 5 kids! Very clean, fun bear decorations, comfortable beds, and great location away from the crowds of Yosemite, but close enough for easy day trips. Beautiful mountain view. Great review off our home! We loved the location. When we finally found the place that we thought would be perfect to share this area and Yosemite! Please come back and stay with us anytime!